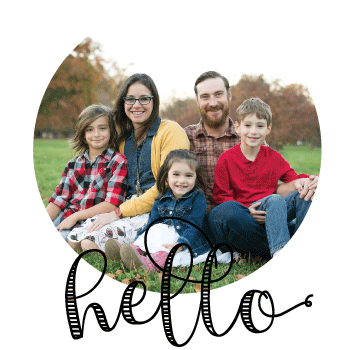 This is a post in collaboration with Latina Bloggers Connect and WGBH. All thoughts and opinions are my own. The kids and I have been keeping busy on our urban homestead. As the cooler weather turns to freezing temperatures overnight, the boys and I have had to pick over all of our remaining hot summer vegetables – mostly green tomatoes, tomatillos, peppers, and eggplants. I’ve also been cutting large quantities of herbs to dry for the winter ahead. There’s still a lot of work to be done on our homestead. We need to process 6 chickens, lay down fallen leaves and alfalfa in our garden areas, and tend to the front yard garden beds which are still producing beautiful root vegetables and greens. With a lot of our time being spent outdoors in the cooler weather, its been nice to make comforting stews to enjoy when the work is done. With fresh picked carrots and beautiful radish tops, I made this traditional Spanish stew for my family last week – un potaje de garbanzos con calabaza y chorizo (a garbanzo, pumpkin, and Spanish chorizo stew). What I adore about Spanish cooking is the simplicity in the meals. Rich and nourishing with seasonal vegetables, they’ll warm you from within. Before I went to chopping away vegetables for this fall stew, I made my children some hot chocolate to warm their tummies after tending to our gardens. They were excited to drink it while watching the brand new full feature movie, Curious George: A Halloween Boo Fest. A perfect combination, don’t ya think? PBS is the only tv station my children watch and of course Curious George is among their favorite shows. They were super pumped to be able to OWN this dvd as their very own. They’ve watched it umpteenth times already. It’s a super cute film. Below is a little Synopsis. While my boys were warming themselves and watching Curious George: A Halloween Boo Fest, I finished the stew for a comforting end to our day. 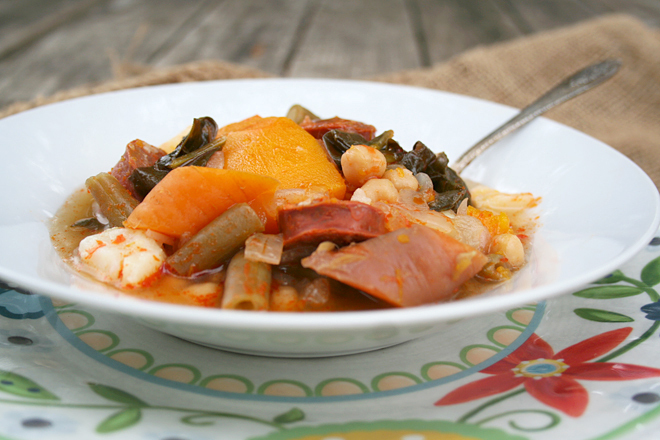 Garbanzos, pumpkin, and Spanish chorizo sausage stew is a traditional Spanish stew made with seasonal fall vegetables. This meal will be sure to warm you from within. In a large heavy bottomed pot or dutch oven, gently heat 3 tbls olive oil. Add the onion and saute until it turns translucent; 4-5 minutes. Add the garbanzo beans and toss through with the onions for another 3-4 minutes. Add the pumpkin, potatoes, carrots, green beans, and Spanish chorizo sausage. Cover with 8 cups of water, and then add the paprika, salt, and pepper. Bring to a boil, cover, and then lower the heat to medium-low cooking for 45-60 minutes or until the garbanzo beans are cooked through and tender. 5 minutes before serving, add a large handful of a dark leafy greens to the stew. What are your favorite fall or winter comfort foods. Please share any recipes with me in the comments below. I love stews. I just made a barley, kale, and sausage stew this weekend. My family will really enjoy your recipe too I think. It’s going onto my Pinterest board today!